A submersible robot operated by scientists at the University of British Columbia has boldly gone where very few others have gone before, probing uncharted depths below a massive floating ice island. In October the researchers deployed the robotic submersible, known as an autonomous underwater vehicle (AUV), under a 40-meter thick fragment of the Petermann Ice Island, calved from a Greenland glacier in 2010. The scientists used the AUV to map the underside of the ice and study the ocean’s role in its thinning, marking a rare venture into an almost unexplored realm. Ice islands, large tabular icebergs several kilometers across, are increasingly a hazard to shipping and offshore oil platforms on the east coast of Canada. The possible risks were well demonstrated this past summer as Petermann Ice Island PII-A, a fragment over 50m thick and almost the size of Manhattan that calved from a Greenland glacier last year, drifted all the way to the coast of Newfoundland before breaking up. 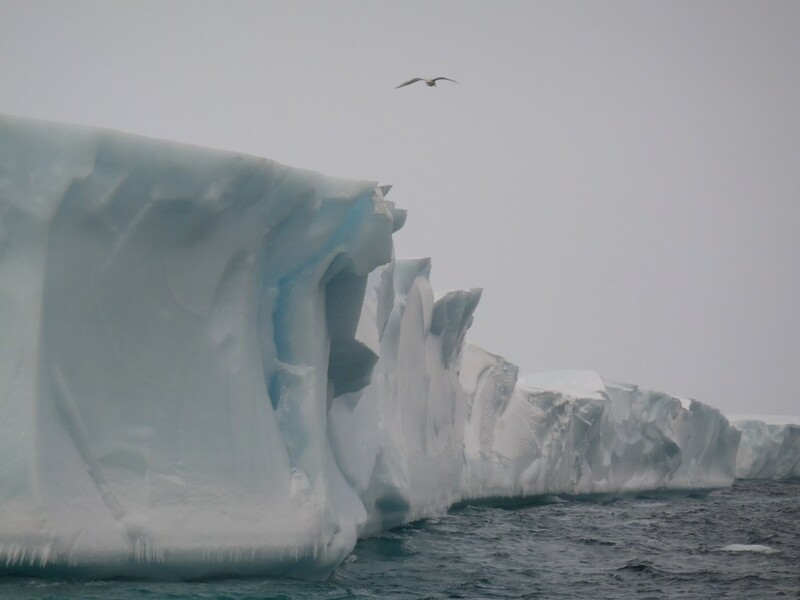 In order to better predict the drift and deterioration of ice islands and icebergs an improved understanding of subsurface process is required as up to 9/10ths of the volume and mass of an iceberg is underwater. However, accessing waters below these ice masses had been extremely limited prior to the advent of high-tech robots. The AUV used for the research, named UBC-Gavia, is operated by Dr. Bernard Laval’s Environmental Fluid Mechanics and AUV lab. UBC-Gavia is a 2.5 meter torpedo-shaped robot, capable of navigating underwater independently for several hours. The AUV was manufactured by Teledyne Gavia in Iceland and takes its name from the genus of the loon, Gavia, appropriately known as ‘the Great Northern Diver’. In collaboration with the Canadian Ice Service and an international group of scientists and engineers the UBC team joined the Canadian scientific icebreaker CGGS Amundsen during a 3-week research cruise in the Arctic this past October. The researchers aimed to deploy UBC-Gavia under another fragment of the Petermann Ice Island, PII-B, which had become partially grounded off the east coast of Baffin Island since March of 2011. PII-B measured 12.1 km long by 7.5 km wide, with an area of 62.5 km^2, larger than Manhattan. “The thickness of the ice island was unknown and the seabed where it had become grounded was not well charted,” explains Andrew Hamilton, a PhD candidate in Laval’s group who helped organize the project and operate the AUV. The team used a sideways angled multibeam sonar operated by colleagues at the University of New Brunswick to select an ungrounded portion of the ice island that was about 35 m thick and floating in about 100 m of water. The AUV was deployed in open water from a small surface vessel beside the island and programmed to dive to 50 m depth before transiting under the ice island for 500 meters before returning. For extra safety the team attached a thin 1000m long line to the AUV for recovery in case of an emergency. This was demonstrated in 2005 when UK researchers from the National Oceanography Centre and British Antarctic Survey sent a large, multimillion-dollar AUV named AutoSub 2 on missions under the Fimbulisen Ice Shelf in Antarctica. On its second mission it did not return and was never seen again. The UK team has since had great success returning data from under Antarctic ice shelves with its sister craft Autosub 3 but AUV missions under thick ice are still extremely rare. “We’ve worked several years to get to this stage, so it was a huge relief when UBC-Gavia popped back up at the surface at the end of the first mission,’ said Alexander Forrest, a PhD graduate from Laval’s lab, now a Post Doc at University of California – Davis, who has deployed UBC-Gavia from the Arctic to the Antarctic. “We subsequently pushed each mission a little farther and we were able to map a portion of the underside of the ice island. The bottom of the island was surprisingly uniform in topography, lacking large crevasses or subsurface fissures. It did gradually thicken further away from the edge, with a more abrupt slope about 700 meters along the transect. The AUV also collected measurements of water temperature, salinity, current velocities which will help us put these data in an oceanographic context,” says Forrest. An extended group of scientists collected a comprehensive dataset of the ice island including Dr. Derek Mueller (Carleton University), Val Schmidt (University of New Hampshire), Richard Yeo (AUV Consultants), Anna Crawford (Carleton University), as well as scientists from the Canadian Ice Service, ArcticNet and the University of New Brunswick. The team will analyze the mapping and oceanographic data from the ice island missions over the coming months to better understand how the ice island is thinning, how ocean circulation and heat transfer occurs, and how the ice island alters the stratification and biological productivity of surrounding waters. To make this step however the UBC team still needs to make some improvements to the AUV. UBC-Gavia aborted two missions while under the ice island due to internal faults and navigational offsets. The AUV was rescued by pulling it in on the safety line, not a glamorous end to an AUV mission. “In the AUV world we say a good day is when the number of AUV deployments equals the number of recoveries!” laughs Forrest. The team is working with the AUV manufacturer and other engineers to acquire and develop technologies that will allow this to happen. They aim to acquire an inertial navigation system (INS) which will dramatically improve navigation performance and a variable ballast system that will allow the AUV to sink if it becomes stuck under the ice, to improve the performance of their through-water acoustic communication system to obtain telemetry when the AUV is underway, and optimize the software and configuration settings to minimize internal errors and premature mission aborts. AUVs are still in the pioneering stage of under-ice development, but their use in Arctic research is expected to grow.